Periodontal disease is identified by the dentist or dental care hygienist during a periodontal exam. This kind of exam should be a component of the regular dental care check-up. A periodontal probe (a small dental tool) is used to determine the size of the sulcus (pocket or room) between the tooth and gum tissue. The depth of a healthy and balanced sulcus is three millimeters or less, and should not bleed. The periodontal probe shows if the pouches are deeper than three millimeters. As periodontal disease gets worse, the pockets typically get deeper. Gingivitis is the first stage of a periodontal condition. Plaque and its toxin by-products aggravate the gum tissue, making them painful or tender, causing inflammation, and making the gums likely to bleed. Over time plaque hardens into calculus (tartar). As calculus and plaque continue building up, the gum tissue starts to recede from the teeth. Deeper pockets form between the gum tissue and teeth and are then filled with micro-organisms and pus. The gum tissue becomes irritated, inflamed, and it bleeds easily. Slight to modest bone tissue loss can occur. The teeth are less supported due to the fact that gum tissue, bone tissue, and periodontal ligament continue to be damaged. 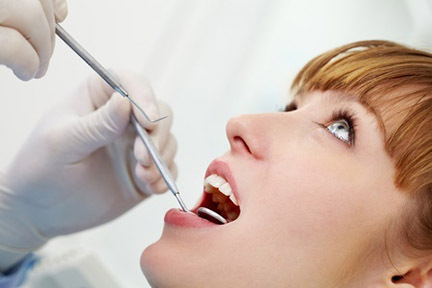 Unless addressed, the affected teeth will become loose and could be lost. Generalized moderate to serious bone tissue loss can occur.